The second thing I discovered over time is that wide, shallow containers expose more of the food's surface to air, which tends to make it spoil more quickly. Since we make almost everything from scratch and had a lot of success with storing our homemade beans in glass quart jars, we decided to see how it'd work with our cooked brown rice and quinoa. Success! With excitement, we moved on to other jar sizes, including pints and half-pints, which are great for sauces. Now we use wide-mouth glass jars to store everything from veggies to leftovers and have never looked back. 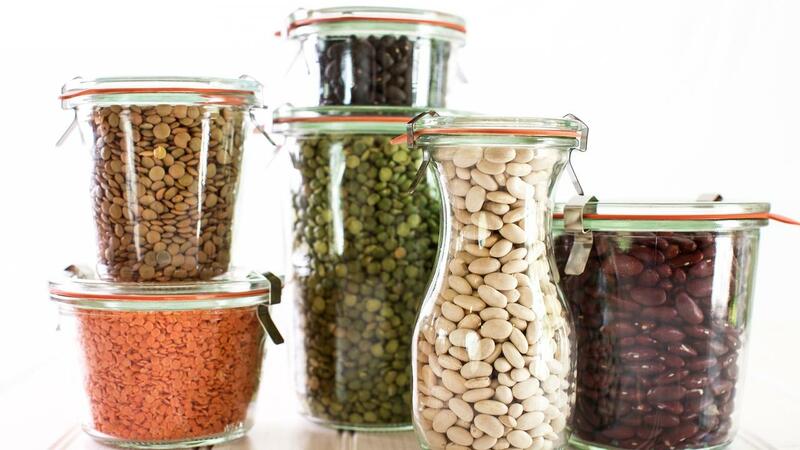 With less plastic, easy viewing, convenience, keeping fresh longer, and affordable storage that's also simple to organize, we've got everything we need in glass jars. Oh, and to get everything into those jars, we use this stainless steel wide-mouth funnel. My all-time favorite use for glass jars is my DIY Salad Bar.